Chick-fil-A is delicious but until recently has only been available in southern U.S. states. Out of desperation (or lack of self control? primordial urge to fry? ), I stole some Chick-fil-A sauce packets and recreated the whole shebang at home. I also talked with a Chick-fil-A HQ employee to get some insider tips on how the chain makes the delicious Chick-fil-A Chicken Sandwich at home. Fun fact: S. Truett Cathy, who founded Chick-fil-A, wrote a book called How Did You Do It, Truett?. Oddly enough that’s what I kept saying to myself in the dark lonely witching hours I spent trying to crack this recipe. The hubris you have, Cathy, the hubris. ANYWAY back to the Chick fil A Chicken Sandwich. The simple secrets in a nutshell: an overnight pickle juice brine and powdered sugar-flour coating. That’s all folks. Try out the full Chick-fil-A sandwich recipe below and freak your friends’ minds. 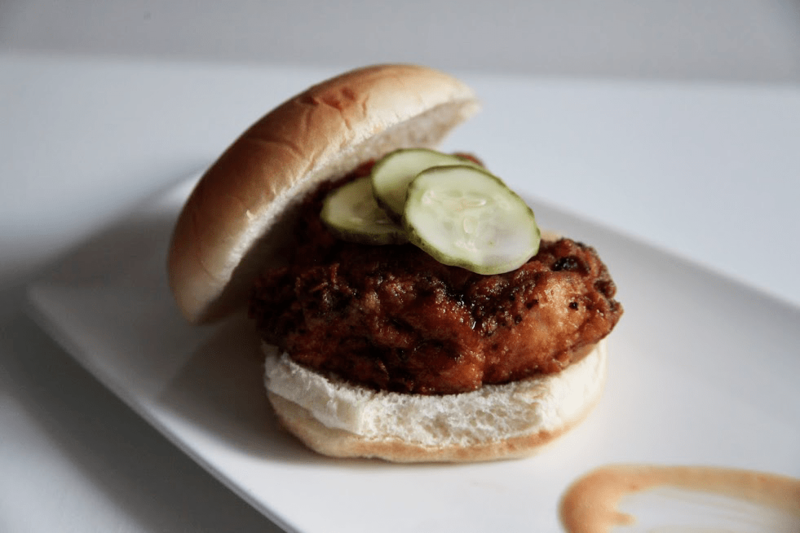 Easy Chick-Fil-A Chicken Sandwich recipe, so good you can make it on Sundays. A Southern classic fast food chain delight made with pickle juice brine. Make the chicken sandwich. Soak the chicken breasts in pickle juice 4 hours – overnight. Lightly pat the chicken breasts dry. Heat peanut oil in deep skillet to 400 degrees F.
In a small bowl, whisk egg and milk. In another bowl, mix flour, powdered sugar, salt and pepper. Dip chicken breast in milk mixture, and then coat in flour mixture. Fry coated chicken breasts until golden and crispy, ~8 minutes depending on your skillet size. Drain fried chicken on paper towels. Make the sauce. Whisk together all of the sauce ingredients until smooth. Assemble sandwich. Spread butter on buns and toast lightly. Spread sauce on top and bottom bun. Place fried chicken and top with dill pickle slices. *Thanks you, tcalhoon on Reddit, for letting me know that they don’t pickle brine in-store, but suspects they do at a plant. The more you know, huh? **Thank you, jonker5101 on Reddit, for letting me know that they use peanut oil instead of vegetable oil. Knowledge is power!